This is post three in a three part project on Evangelism in Davis Square, MA, co-written with Ross Ponder. I've made some final editoral omissions. Part one, on evangelistically relevant characteristics of residents, is here. Part two, drafting a contextual theology of evangelism, is here. The evangelizing community practices evangelism to invite others to participate in a unique and shared way of life, we call the kingdom of God. Below we develop faithful evangelistic practices to the jaded, progressive, educated, aspiring, and sojourning people of Davis Square. We continue to use our contextual definition of evangelism, call to a community of cause, highlighting specific methods to voice the call of a shared narrative, to shape a communal way of life and to join in service of a common cause. Practicing call narrates the story of God’s people in fresh ways to others. Stone writes, “This story [of the people of God], with its various characters, subplots, twists, turns, and surprises, literally ‘makes sense’ out of the Christian life by depicting its beginning, way, and end and thereby orienting us on a journey” (55). Therefore, our suggested practice of call seeks to demonstrate the uniqueness of the Christian story within the context of competing narratives. This present study, mindful of the Davis Square context and Christian narrative, recommends that College Avenue’s practice of call address other narratives of faith. As noted above, Diana Eck’s research on the growing diversity of religious faiths in America raises challenges for the Christian evangelist. How does one practice authentic, Christian evangelism in the context of a plurality of religious faiths? To answer this question particularly, the present study recommends convening an interfaith forum. A general description of the forum follows. The interfaith forum would include religious professionals from various traditions. The representative faiths might include Islam, Judaism, Hinduism, Buddhism, and Christianity. Each panelist would be asked the same question and allotted the same amount of time to address it. Questions could include: 1) What happens after death? ; 2) What are core practices of your faith? ; 3) On what basis does your faith tradition claim authority? ; 4) What is your message to the world?, etc. The audience would also be given the opportunity to pose questions. The hosting church's role would be that of facilitator rather than panel participant. Acting as a welcoming host at the interfaith forum could establish the church’s evangelistic practices as principled and conversational. Such a forum would seek to inform the audience such that they might more responsibly accept or reject the Christian call. Evangelistic practice in Davis Square would thus acknowledge its religious neighbors and present the Christian message in a context of hospitality. Articulating an account of Christianity in a pluralistic context is perhaps most relevant among the highly educated of Davis Square. These savvy and quick-witted individuals can easily recognize shallow stories and philosophies. Evangelists of College Ave. UMC will need to feed the highly educated of Davis Square spiritual milk in the form of intellectual cuts of meat (or tofu, it is Davis Square, after all; 1 Cor. 3:2). Faithful witness offers intellectually substantive retellings of the Christian narrative. Christian evangelists must translate the basic root of the gospel’s truth and transformative power into a clear and intellectually aware story, complete with a beginning, middle and end. Though, the most powerful evangelistic practice is shared life. Evangelism is largely accomplished in the public display of the “beauty of holiness made real in the church” (Stone 12). Stone draws attention to the evangelistic nature of the church in Acts, whose joy, unity, material sharing, inclusive table fellowship and resistance of the powers, constituted a major part of their witness (Stone 103-6). Thus, witness in Davis Square must address the need to foster a distinctively Jesus-like way of life. As Kinnaman concludes, the best hope of changing negative (and accurate) perceptions of Christianity lies in “embodying a way of life that reflects the truth of who God is and how he has called his followers to live” (227). Alan Roxburgh, author of Missional Map-Making, approaches the missional revitalization of the church by eschewing the widespread calls for strategic planning and visioncasting in favor of “cultivating a core identity” and “creating a parallel culture” (127, 143). This includes “rediscovering some basic habits and practices of Christian formation critical for discernment and the capacity to name what we are seeing God do in our time and place” (137). Roxburgh suggests several essential practices for the community’s new nucleus: the daily offices of prayer, a monthly practice of hosting a stranger for dinner, intentional friendships with the poor, and serious engagement with the biblical story (151-162). Other authors confirm the need for the church to bear witness through a unique way of life, suggesting their own sets of practices. John Westerhoff highlights the importance of promise-keeping, simplicity, creation-care, daily prayer and Scripture meditation for catechesis (Chilcote 244). Stone focuses on communal practices of Eucharistic sharing, the baptismal formation of a new people, forgiveness and restoration, the open assembly of the Spirit, and community organization on the basis of universal spiritual giftedness (181). This study, in response to both the Christian narrative and the Davis Square context, recommends cultivation of parallel culture and way of life through a short list of foundational practices. Following Roxburgh, we propose recruitment of “small numbers of people into some simple experiments in Christian practices” (148). Also with Roxburgh, we recommend that members of this core commit to hosting neighbors, co-workers and associates for dinner on a monthly basis. The transient sojourners of Davis Square are especially appropriate recipients for these invitations. Practicing hospitality in this way, a church can offer a community of belonging. At meals, hosts should seek to develop and exercise the skills of an attentive listener, a thoughtful question-asker, and a generous giver. This practice of hospitality seeks to equip the core with greater openness to the other and display God’s welcome. With both Roxburgh and Westerhoff, we propose that the new community’s way of life include both a daily rhythm of prayer and serious engagement with Scripture. Prayer is a practice whose goods are internal--it enlivens personal connectivity with the Trinity. We propose a contextual prayer practice of morning intercession and evening examen. Prayer would thus prepare individuals for their daily interactions and allow reflection on God’s presence throughout the day. Further, in engaging scripture, believers prioritize inhabiting the Christian narrative. Members would also read sections of scripture privately on similar schedules. Stone’s emphasis on the Eucharistic meal provides the context for the final practice--the weekly gathering. This weekly or monthly gathering should include a shared meal and discussion “with glad and sincere hearts” (Acts 2:46) about: (1) their experiences in hospitality, (2) their discernment of God’s activity in their daily sphere, (3) the areas of sin with which they are contending, (4) their learnings though scripture and (5) their engagement in the practice of cause. By way of clarification, the evangelistic aim of these practices are primarily community and identity formation, not directly social transformation or Christian image-repair. Nevertheless, if they take root, fostering love and humility, these practices will most directly impact the jaded. In addition, as they also foster a community of belonging for the stranger, these practices will offer a welcoming home for the sojourner. Together these practices serve as a skeleton of the way of life that embodies the evangelistic call. Not merely instrumental, these practices give shape to a “parallel culture” that reflects the kingdom of God and thus serves as salty salt and a city on a hill (Matt 5:13-16). As a community of cause, the church is called to participate in the Trinity’s pluriform work of cosmic redemption. While the general call opens endless possibilities in terms of which dimension of the mission the church may focus, we recommend that faithful witness among the residents of Davis Square begin by partnering with an already existing local for-benefit organization whose mission can be located within the scope of the missio dei. Before outlining recommended details of this partnership, we wish to elaborate the contextual nature of this overall approach. George Hunter III describes St. Patrick’s missionary approach as searching for signs of God already at work in the culture (Hunter 20). This posture, also characteristic of Donovan, follows in the footsteps of Paul’s evangelistic proclamation in Athens “I can see that you are very religious” (Acts 17:22). Something similar will be appropriate in the “Athens of America.” Among the politically progressive and aspirational we see signs of God already at work drawing them to participation in the redemptive mission. As noted above, the politically progressive often share common cause with the religious regarding issues of social justice and human unity. Aspirational emerging adults seek deep satisfaction from their pursuits beyond money or status. A faithful, evangelistic practice of cause affirms, enriches, and fulfills the nascent work of God within the aspirational and politically progressive. While several for-benefit organizations could be partnered with in common cause and are grounds for affirming the participation of Somervile residents in the missio dei, we recommend seeking a common-cause partnership with Somerville Community Corporation (SCC; www.somervillecdc.org). SCC offers services and leads community organizing efforts that support low- and moderate-income Somerville residents attempts to achieve economic sustainability and increase civic participation. Recently, SCC decided that “preserving and enhancing the remaining economic, racial, and ethnic diversity of our population” would be the “overarching priority” that drives their work. Somerville is bracing for a billion dollars in public and private investment over the next few years. IKEA’s Somerville branch will open in 2011. According to Mayor Joseph Curtatone, plans are underway for a “brand new neighborhood along the Mystic River, with five acres of new waterfront park, 2100 units of housing, a million and a half square feet of office and R & D, more than a million square feet of retail.” The driver of all the development is the promised extension of the MBTA’s Green Line, resulting in six new T-stops in Somerville alone. While property owners will celebrate the inevitable rise in property values, housing opportunities for the SCC’s constituency will become more difficult. These changes are sure to have an effect on the transient population of Davis Square, as well. Our recommendation is that a church invest in SCC through congregants becoming “members” of SCC who serve on committees, participate in organizing campaigns and attend annual events. While there are no membership fees, we strongly recommend that financial support be given both individually and collectively. 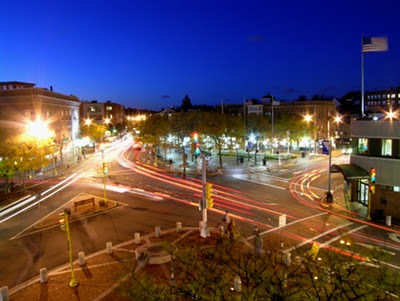 Our hope, and belief, is that this engagement would constitute a common cause with both the politically progressive and aspirational of Davis Square, partially in service to the sojourning.